In the Hebrew Scriptures, there is an ancient tale of a fortified city with walls that could not be breached. God had a plan to take that city. So he had his soldiers march around the city seven times. On the final circuit, they would blow trumpets. With that mighty blast, the walls would come atumblin down. I begin this post with this particular story because it was the insistent blast of instrumental music that would bring down the fortified walls of my faith. You will recall that one of the doctrinal distinctives of the Church of Christ is the exclusive use of non-instrumental music in worship. To put it bluntly, singing in church with instrumental accompaniment will send you to hell faster than being a mass murderer. In fact, if the mass murderer was a member of the Church of Christ, he would have a much better shot at Heaven. I grew up believing in the absolute correctness of that position. As I grew more and studied more, I began to have doubts. To fully appreciate my quandary, you have to know a little more about me, or at least, the me that was. I was a talented, perhaps even gifted singer. It manifested early, and was quite unambiguous. By the time I was 13, I was something of a celebrity in my church circles which happened to be quite broad. Since we didn’t employ the talents of piano players, we used song leaders to direct the singing of the congregation. I was a champion, award-winning song leader. I mean that literally. I have the trophies to prove it. I was known nationally for my ability. I was heavily invested in the Church of Christ doctrine of singing a cappella. I was also a burgeoning musician. I played several band instruments, and was becoming proficient at the piano. I would go on to be a published song writer. But that is another story. I had the musical chops to become a church musician. I had the singing voice to be one of the premier song leaders of my time. I had no interest in bringing instruments into the church. I did, however, want to formally introduce the use of choirs into the official worship service. As hard as I tried, I could find nothing wrong with it. Neither command, example, inference, nor silence from the scripture forbad the practice as near as I could tell. One of our favorite slogans was that we would speak where the bible speaks, and remain silent where the bible was silent. On the matter of choirs, I became increasingly certain that we were making law where there was none for the sake of our comfortable tradition. On that subject, we simply were not right. As I studied the subject of acceptable modes of musical expression in church, I also began to question our stance on instrumental music. That is where the real problems began. While in the church, there was always an undercurrent of debate among liberals and troublemakers about music in church. There were always some who argued that our traditional position was wrong. I lost one or two of those debates growing up. Those counter arguments stayed with me. When it was my turn to take a good, long, independent look into the matter, I had to acknowledge that the Church of Christ position might be wrong. And that was a really big deal. Understand that I didn’t immediately admit that we were wrong, just that we could be wrong. That was pretty much the same thing. The possibility of not being right about an important religious matter was enough to rock my world. That may sound strange to you. But you are not thinking like a religious conservative. Consider this: A Catholic would never consider the possibility that the Pope could be wrong. In orthodox Catholicism, the Pope can’t be wrong. He is infallible. That would be like saying Jesus or Paul was wrong about a matter of doctrine. The notion is simply preposterous. Though the Church of Christ had no Pope, our unwritten creed was our infallible doctrine. Our beliefs were not right because we thought they were right. Our beliefs were right because they were decreed by God. It was not just that we were right, but that there was no possibility of us being wrong. To admit the possibility of being wrong was to admit that our doctrine was not the precise dictates of God, but merely our interpretation. If we were acting in accordance to our human interpretation, then we were no better than the Baptists who were clearly going to Hell. Yet as more time past, the more I knew we were wrong. Music was a salvific issue for us. It was not a secondary matter. I had become convinced that we were wrong about a salvific issue. The only way to salvage my faith was to demote music to a secondary issue. As I became more vocal about the matter, I grew out of favor with the leadership. The last thing they needed was an up and coming influencer who would draw people away from the status quo. I had worked out in my mind that it was okay to be wrong about secondary issues. There was another saying of which we were somewhat less fond: In matters of faith, unity. In matters of opinion, liberty. In all things, charity. The problem is that we hardly credited anything as a matter of opinion. It was all a matter of faith. I soon came to realize that one person’s matter of faith was another person’s matter of opinion. As a hermeneutic, this was untenable. There had to be some way to distinguish the two. I devoted the remainder of my time in the church looking for the delineating factor. I never found it. If we could be wrong about our classifications of faith and opinion, we could be wrong about anything. We could be wrong about everything! That realization shook me to the core, and changed my life forever. Everything had to be reexamined, and I had to be the one to do it. I couldn’t trust anyone else, not even my father. Everyone I respected as a church leader was painfully and obviously wrong about some fundamental things. It started with music, but didn’t end there. Who could I go to but the liberals and the troublemakers. They were the only ones who could see behind the curtain. They were the only ones not blinded by tradition and personal preference. I sought them out. I read their books. I questioned and debated them. I had to be sure. Never again would I be the victim of another person’s faith. There was only one thing for me to do. I had to reexamine everything I had been taught. And reexamine, I did. Durring the process of reexamination, I discovered the most unsettling thing of all. I had become the highest authority in my religion. I trusted no one else, for they had all deceived me, with few exceptions. My church was no longer infallible. They could and had gotten things wrong. The only way I could know what was right was to study it for myself, and accept what was revealed by the evidence. I was equipped for the study. I had been preparing all my life for this adventure. I had the resources and the knowledge. What I gained was the conviction that I would believe nothing that I could not understand and prove for myself, at least in the realm of religion. With that resolve in place, I opened my bible and read it again for the first time. Shocked at what I discovered, I read it again, and again. After some time, I was finally able to acknowledge an unavoidable truth: As a lifetime member of the churches of Christ, I was quite literally wrong about everything I once held dear. 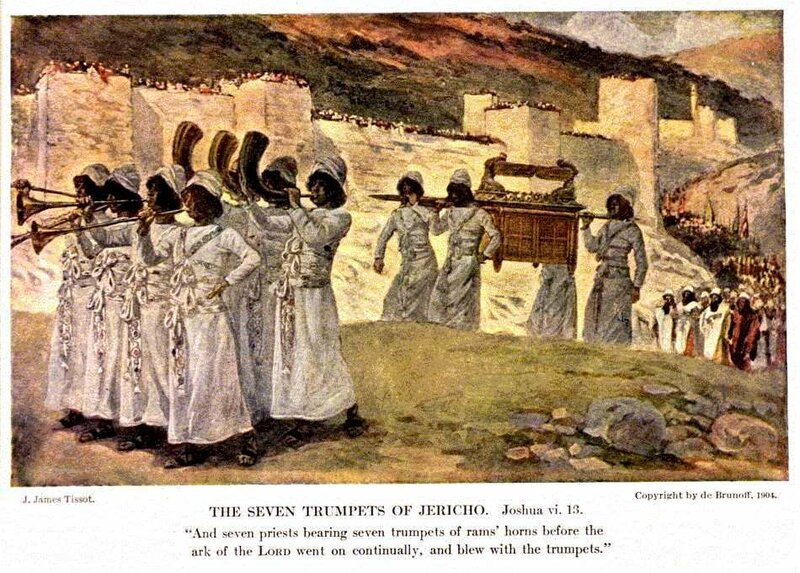 And the walls of my Church of Christ Jericho came atumblin down.